As days become shorter and evenings darker, it’s time to double down on soups and stews. If you’re looking for lighter soup options, look no further than this Vegan Tomato Soup. It’s rich and creamy without any dairy and roasted garlic gives it a flavor all its own. All I want to cook this time of year is big batches of hearty warming dishes. I’ve never met a soup that doesn’t appeal to me. This Vegan Tomato Soup is great because it’s savory and creamy without giving me the potential stomach ache dairy can cause. Don’t get me wrong, I do love creamy soups made with milk like Roasted Tomato Soup and I make and eat them often. On the other hand, my stomach usually has problems afterwards. That’s why it’s sometimes a good idea to make dairy-free soups like this one. If you’re afraid this soup won’t fill you up, add a side like Vegan Quinoa Salad and toast to dip, or load up on toppings (keep reading for more on that)! 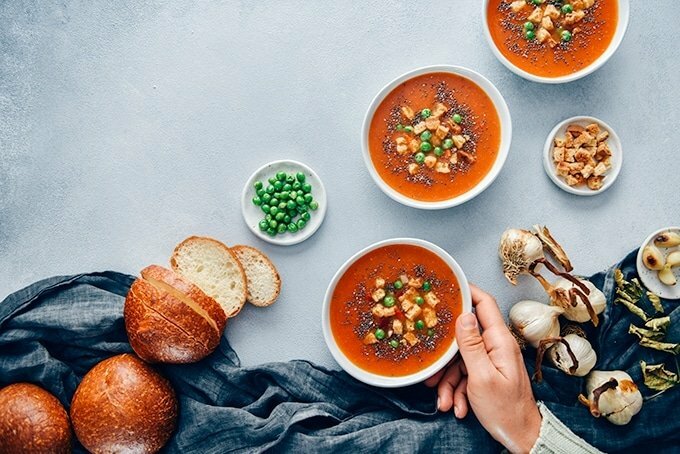 This vegan tomato soup recipe is also a great option if you’re trying to eat more vegetarian or vegan food. Although I eat meat, I try to cook vegetarian or vegan meals a few nights per week because it’s great for my wallet. For a super budget-friendly version of this recipe, use canned tomatoes rather than fresh. My Vegan Tomato Soup not only avoids dairy, it doesn’t use a plant-based milk either. Instead, I use water. I know what you’re thinking but this soup isn’t watery at all. The base of onion and tomato paste help to bring flavor and texture. Plus, the chopped tomatoes and roasted garlic that are blended in help give it a creamy texture. Roasting garlic is a super simple trick that is both impressive and useful. In this case, it gives the soup a unique and delicious flavor. To roast garlic, simply wrap a whole head in foil and roast in the oven for 40 minutes. Alternately, you can cut the top off the head of garlic before wrapping it so that it’s easier to get the cloves out. Next, just peel and use. Regardless of how you do it, roasted garlic adds a flavor all its own. Furthermore, the garlic makes this recipe extra creamy when it’s blended with the tomatoes. This soup calls for 3 to 5 heads of garlic and you can add as little or as much as you’d like. When you’re done, use leftover roasted garlic to upgrade the rest of your week’s meals. You can blend it in Vegan Turmeric Tahini Dressing, mix it into Hummus Without Tahini, add it to Balsamic Roasted Brussels Sprouts Salad or indulge in roasted garlic bread to name a few. Is This A Gluten Free Vegan Creamy Tomato Soup? Another great feature of this soup is that it is gluten free. In many soups all-purpose flour is used to thicken the base. This produces gluten when heat and water interact with the flour. My Vegan Tomato Soup uses rice flour instead. Rice flour has the same thickening properties as regular flour with the added bonus of being gluten free. Other options that can be substituted include arrowroot, cornstarch and potato flour. Regardless of the thickening agent, make sure to whisk it with cold water to form a slurry before adding it to the soup. If the rice flour is added directly to the hot soup it will congeal and form clumps. Finally, once you’ve finished cooking your vegan creamy tomato soup it’s time to garnish. Suggested garnishes include chia seeds, red bell pepper and croutons (gluten free or regular) but feel free to get creative. A drizzle of pesto, chopped green onions, basil leaves or even edible flowers would all look great. I can’t wait to see how you make yours! 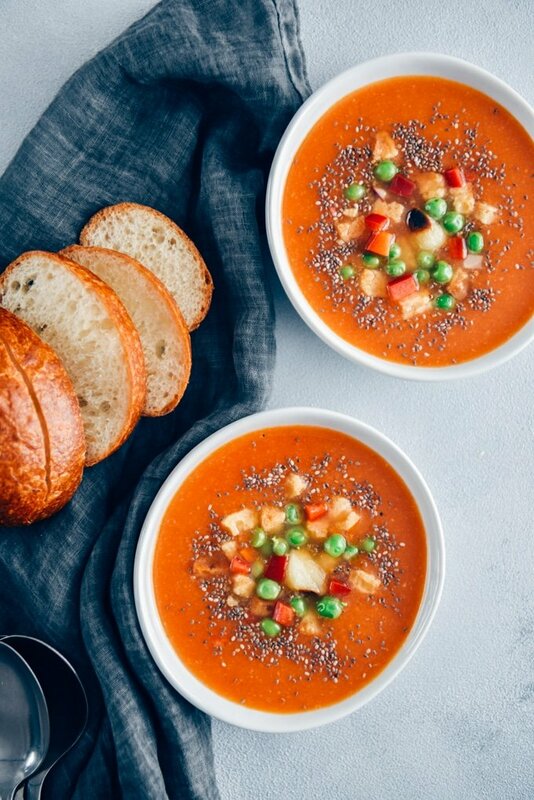 Please don’t forget to rate this recipe and leave a comment below if you have a chance to make this Creamy Vegan Tomato Soup! Need more vegan soup recipes to warm you up? Check out the following recipes! Your soup looks so tasty! Hope you are doing well. Thanks for the shout-out for my soup! Thank you Kalyn! Your soup is so good that I had to share it with our readers. Hi Kristen! No dairy doesn’t mean a boring soup, right? Making soup in the Instant pot is a great tip! Have to try your butternut squash soup asap!